1. Through the will of Jehovah Mephalte, the Lord our Deliverer, Moses was given the power to set the Israelites free from their slavery in Egypt. God delivered the Israelites in a spectacular rescue that included the parting of the Red Sea to provide an escape route for the Israelites who were fleeing their ruthless Egyptian Masters. “I will” appears 7 times. 2. He handed over the nations and the Promised Land to the Israelites. God is the conveyer of grace. He seeks us out and bestows his unmerited favor on those who will accept it. When we have faith, we receive righteousness handed to us freely from the hand of God. God handed over his son for the sins of humanity. God gives us justification and life when we accept his son. God will hand eternal life to those who come in the name of his son. 3. Hannah was given a child. God delivered her from her anguish and persecution because she had not conceived. Sarah was barren and God brought her aged body to life and enabled her to conceive and bear the child Isaac. 4. Jonah was sent to Nineveh to warn them of judgment if they did not repent of their sin. Elijah was given the word that there would be no rain or dew for years because of the gross immorality Ahab had encouraged in Israel. When the brook dried up, God sent him to Zarepath where he met a starving family, a widow and her son. God sent Elijah to deliver the widow. God sent power to Elijah that enabled him to provide vessels of oil and flour that never failed to provide food for them all. He sent a mighty fire from heaven that lit the sodden sacrifice prepared by Elijah. 5. The king declared that Daniels God was the God of gods, and the Lord of kings and Daniel was made rewarded and made a ruler in the land. 6. Joshua was promised the Israelites would overtake Jericho. The people followed the instructions from the messenger sent by God and the walls of Jericho fell. 8. He preserves those who are faithful and true to him. Those who have regard to the weak. He preserves the souls of the saints. Romans 7:24 KJV O wretched man that I am! Who shall deliver me from the body of this death? When we talked about the God of righteousness, Jehovah Tsidkenu, we found that this awesome God can tolerate no sinful condition in his presence. And man…has no claim to righteousness. Romans 3:10-18 As it is written: “There is no one righteous, not even one; 11 there is no one who understands; there is no one who seeks God. 12 All have turned away; they have together become worthless; there is no one who does good, not even one. 13 Their throats are open graves; their tongues practice deceit. The poison of vipers is on their lips. 14 Their mouths are full of cursing and bitterness. 15 Their feet are swift to shed blood; 16 ruin and misery mark their ways, 17 and the way of peace they do not know. 18 There is no fear of God before their eyes. God has a history in the role of deliverer. Without God our struggle in our own strength is doomed to failure. Romans 8:25 I thank God through Jesus Christ our Lord. God has provided deliverance. Looking at the definition of the word “deliverer, we can find many instances of God in his holy role as Jehovah Mephalte, deliverer of his people. The definition of deliverer in Webster made me ask; “How does God meet these definitions?” We will discuss how Jesus meets this definition in another segment. Read Exodus 6:6-8. How did God act as Jehovah Mephalte in this verse? From your previous experience in the word of God, was this promise of deliverance kept? How many times does the phrase I will appear in this text? a) I will bring you out from under your burden. God will deliver us from the burden of sin. b) I will redeem you with outstretched arms. God is reaching for us with love and longing. He has a plan to salvage us from our sins, but he must come to him for it. c) I will take you to me for a people. He not only has plans to save us; he has plans for our future. e) I will bring you into the land. These “I wills” are a picture of what God wants to do for us. The Old Testament is a picture, an arrow, pointing to Christ. The land that was promised to the Israelites was Canaan. For us, it is a picture of the Christian life as we should be living it. We are given all spiritual blessings. The Holy Spirit gives us the power to utilize and enjoy them. Ephesians 4:1, And do not get drunk with wine, for that is dissipation, but be filled with the Spirit, Ephesians 54:1-2 Therefore be imitators of God, as beloved children; 2 and walk in love, just as Christ also loved you and gave Himself up for us, an offering and a sacrifice to God as a fragrant aroma. f) And I will give you the land for a heritage. Our heritage is our salvation and it involves so much more than we realize. We have access to God; The Holy Spirit to strengthen us and teach us, God’s love is real. We have been delivered from the wrath we deserve. We have been justified and have peace with him and in our hearts if we will just receive it. Read Exodus 23:30-31, Romans 3:24, Ephesians 2:8-9, Romans 4:3, Romans 5:13,18-21, Exodus 20:3-17. From these verses make a list of ways God has acted as Jehovah Mephalte, the Lord our Deliverer by taking, handing over, or conveying something? Can you think of others? Write them and the Bible verses to share with others. He has no reason to justify us. He freely gives us grace, his unmerited favor, because we need it. We receive his grace, through faith, which is also given if we listen to the word of God. Adam’s sin, his disobedience brought condemnation and death. The infinite Christ’s one act of obedience brought righteousness and life eternal. Read 1 Samuel 1:1-9, Gen. 25:23, Genesis 17:15-16. . From your reading of the above verses, discuss how God acted as deliverer in the lives of these three women. Jehovah Mephalte is merciful, all seeing, and all powerful. Being a deliverer is just one characteristic of Yahweh. He is interested in delivering us from our personal problems and stress. God is a deliverer in this sense also for he delivers his word to his people. Each time he gives his word, he also has a definite target or destination for his word as well as a definite purpose. Read Jonah 1:1, What was the word given to Jonah and what was its intended target. Read 1 Kings 17:1 What word did God give to Elijah and who was the target? God also sent word to Elijah on at least two other occasions for another purpose. Read 1 Kings 17:2-15, What did God say to Elijah and why? What did God send to Elijah other than his word? Read 1 Kings 17:16-38. Who did God send Elijah to and why? 1 Kings 17:16-38 tells the story of a confrontation between the priest of Baal and The God of Elijah. The verses that concern us as we define our deliver are 1 Kings 17:31-38. Read 1 Kings 17:31-38. What did God send to Elijah that ensured his victory over the priest of Baal? Elijah was sent to deliver God’s opposition to the worship of Baal and those who were participating in that worship. He was given words of prophesy and signs of great wonder to verify his rebukes from God. God also sent word to Elijah advising him as to where he could find protection and sustenance from his enemies. God always delivers. He can be counted on to follow through on his promises. Many stories in the Bible talk about God answering prayers. Abraham would be the first to declare that God always delivers on his promises. Daniel, a prisoner of Nebuchadnezzar, was expected enter the kings service after being trained in the ways of Babylon. This included the worship of strange Gods, idols, which Daniel knew was forbidden in his own religion. Daniel 1:88 But Daniel purposed in his heart that he would not defile himself with the king’s dainties, nor with the wine which he drank: therefore he requested of the prince of the eunuchs that he might not defile himself. He retained his faith in the most high God and was rewarded with wisdom and good health. Later we read of the kings perplexing dreams, which only Daniel was able to interpret through revelation from God. Read Daniel 2:47-49 47 God sent the dreams to Pharaoh as a warning and he sent the answers to his faithful servant Daniel. What was the result? God delivered Noah and his family and sent them out to repopulate the earth. Abraham received the promised son. Israel received the promised land, at least all of it that they were brave enough to take. Read Joshua 5:13-15, Joshua 6:2. Joshua 6:20. The people marched around the city of Jericho as they were instructed. I wonder if they knew what was going to happen. Certainly the people of Jericho did not know. What was promised? What was the desired result of God’s instructions and did it come to pass. How dumbfounded they must have been. They got the desired results from Jehovah Mephalte. All they had to do was rush through the broken walls and take the city. He had delivered what he had promised. Read Revelation 13:8. Who was to rescue mankind? Jesus is the fireman, the policeman, the Coast Guard. He is the Marine, the foot soldier, the Navy and the Air Force. He alone can save us. The plan of the Trinity (Elohim) before the world began was to save mankind. Jesus is the Lamb slain from the foundation of the world. The blood of this sacrifice streams throughout the stories of the Bible. The plan to rescue mankind involved all members of the Godhead. The Father would give His Son to be the sacrifice. Jesus would be the innocent sacrifice who would die to pay the penalty for the sin of man. His blood would be offered to cover man and provide the justification necessary for him to enter the kingdom of heaven acceptable to God because of what Christ had accomplished on the cross. John 3:16; 10:17-18 The Holy Spirit would provide the line of communication between God and men. He would teach men the knowledge and power of the grace that was offered to whoever would come. And of course Shadrach, Meshack, and Abednego, and Daniel in the Lion’s den. God personally entered the fiery furnace to rescue them and shut the mouths of the lions to deliver Daniel. Psalm 12:7 Thou shalt keep them, O LORD, thou shalt preserve them from this generation forever. Read Psalm 31:23NIV. Psalm 41:1-3NIV Psalm 97:10 ASV Who does the Lord preserve? Though we might fail in our walk with God, he does not forsake us but instead preserves us. Our souls are protected by Jehovah Mephalte. And my favorite…Psalm 116:6. The LORD preserveth the simple: I was brought low, and he helped me. I love this verse because it refers to me personally and I am grateful he thought to preserve the simple. Jehovah Mephalte, The Lord Our Deliverer; how I need him. He sets me free, delivers his word to me, and conveys grace and favor to me. He assists women in giving birth. He always keeps his promises and his word produces results. He personally enters the fiery furnace of our trouble and iniquity to save us. He always delivers the promised, desired and expected results promised by his word. He rescues us from death itself and preserves us by the efforts of the Holy Spirit that we might enter the Kingdom of Heaven. Do you believe in predestination? Why or why not? I have definite feelings on the subject but want to get your view as well. Predestination…A big subject so early in the morning. My thoughts on this have evolved through the years. As I began to study the Bible independently I found myself thoroughly confused, but eventually worked my way through several observations before I finally settled on the answer below. I hope God will continue to show me His will for us through the Scripture and that I might truly understand will. Romans 8:29-30 For those God foreknew he also predestined to be conformed to the image of his Son, that he might be the firstborn among many brothers and sisters. 30 And those he predestined, he also called; those he called, he also justified; those he justified, he also glorified. and Ephesians 1:5 5 he predestined us for adoption to sonship through Jesus Christ, in accordance with his pleasure and will—and 11 In him we were also chosen, having been predestined according to the plan of him who works out everything in conformity with the purpose of his will. “according to the plan”, is the part that people who believe that man has no free will do not appear to consider. It is all about Jesus: born of a virgin, lived a sinless life, was crucified for my sins, was buried, and raised to new life on the third day, ascended to heaven where he sits at the right hand interceding for me. The gospel preached by the apostles. If God is omniscient and omnipotent would imply predestination. He knows before you are born, who you are, what you will be, the choices you make and where you will wind up. But Free Will is Bible based. I think we have a misreading of the Bible with predestination. Ephesians 1:4-5 According as he hath chosen us in him before the foundation of the world, that we should be holy and without blame before him in love. Having predestined us into the adoption of children by Jesus Christ to himself, according to the good pleasure of his will. Here I think that those who are predestined refers to those who choose to accept the Son. Before the foundation of the world, Elohim, the Trinity, provided a plan by which sinful man could be saved and become God’s children. Those who would be saved would be those who accepted the gospel of Jesus Christ, born of a virgin, living a sinless life, crucified for my sins, buried, rising on the third day and ascending to heaven to stand at the right hand of the Father. In that sense we are predestined . I do not think all things are preordained. With my Baptist background that may surprise you. From what I can see God does not preordain everything about an individual’s life. There are some things preordained. 1) Israel, along with the Gentiles, would put Jesus to death (Acts 4:26-28); 27 “For truly against Your holy Servant Jesus, whom You anointed, both Herod and Pontius Pilate, with the Gentiles and the people of Israel, were gathered together 28 to do whatever Your hand and Your purpose determined before to be done. 2) Christians would be conformed into the image of Jesus (Rom. 8:29-30); 29 For whom He foreknew, He also predestined to be conformed to the image of His Son, that He might be the firstborn among many brethren. 30 Moreover whom He predestined, these He also called; whom He called, these He also justified; and whom He justified, these He also glorified. 3) man would be redeemed by means of the crucifixion (1 Peter 1:20-21-20 He was foreknown before the foundation of the world but was made manifest in the last times for the sake of you 21 who through him are believers in God, who raised him from the dead and gave him glory, so that your faith and hope are in God. and Acts 2:23 this Jesus, delivered up according to the definite plan and foreknowledge of God, you crucified and killed by the hands of lawless men. Do I believe that God s omniscient and knows what we will do? Yes, He knew of the famine that would come to Egypt and sent a dream to the pharaoh to warn him. He had already sent Joseph to interpret the dream. He told Abraham that his descendants would be slaves for over 400 years and planned for their deliverance. The Bible tells us that God knew the ten plagues would harden the heart of Pharoah toward the Hebrews. God did not cause him to do it. Pharoah had the freedom to act differently, but his pride got in the way and God used the situation to bring about his plan. God sees how we struggle over our decisions, but we are free to make it as we wish. His foreknowledge of our ultimate decision did not cause us to do it or influence our decision. He simply knows what is going to happen. The Lord is not slow in keeping his promise, as some understand slowness. He is patient with you, not wanting anyone to perish, but everyone to come to repentance. 2 Peter 3:9. “It may occasion some surprise to discover that the doctrine of Predestination was not made a matter of special study until near the end of the fourth century….They of course taught that salvation was through Christ; yet they assumed that man had full power to accept or reject the gospel. Some of their writings contain passages in which the sovereignty of God is recognized; yet along side of those are others which teach the absolute freedom of the human will. Since they could not reconcile the two they would have denied the doctrine of Predestination. I have thought about this a lot as you can see. Now it is your turn. Tell me what you think. You go girlfriend! Right on! I believe God has a plan for my life. Do I always follow that plan? Well maybe not. But God always has other deversions available just in case. I believe he leads us through difficult times to strengthen our faith. Watching us grow in that way must be very entertaining to Him. I believe he sends friends; helpers and angels to keep us on track. But I believe he uses our talents and desires to achieve the end goal. Which is accepting the grace in the end. I for one would not want to know the whole story ahead of time. Knowing me I would just want to change it. I am just as happy knowing that someone way bigger than me is in charge. I always think of the book God Winks and all the things that happen daily to us that we have no control over but could only be Gods work. I have seen things happen way to often that could only be Gods work. What direction is God taking me? I have no idea. But I will not fear because he is always there beside me. I probably didn’t say this as well as you did but I think we each came to similiar conclusions dear friend. The Israelites were zealous for God. They avidly obeyed the law, even adding to it in an effort to perfect righteousness. God was their objective and this was a good thing, an admirable vocation, but it was flawed. They did not submit to God’s righteousness. As a matter of fact, they did not understand that the righteousness of God was based on faith. That faith was a gift from God, free…without strings or human effort. There was nothing they could do to earn it. We are often in the same boat as the Israelites. We go to church, sing the hymns, pray, and even study one day a week or maybe two. We are busy, busy, busy, doing the work of the “church”. I am not saying that is a bad thing, but it is not enough. We do not have discernment about the real meaning of righteousness, the kind of righteousness required of us by God. We carry our big pristine Bibles back and forth for years and never perceive what it really means to be saved. We do not grow. We see no Spiritual growth because we do not develop Spiritual discernment. Elohim, the Trinity, looked at the ruin and misery that resulted from the depravity, deceit, destruction, and hurt of sin and declared that the whole world was guilty before Him. The holy God looked at man and said, For everyone belongs to me, the parent as well as the child—both alike belong to me. The one who sins is the one who will die. Ezekiel 18:4 It is a righteous judgment for He is the Creator and His character of righteousness requires justice and truth. Yet His character is also merciful, loving. So God has a problem. If He does what His Holy nature requires, He would wipe out the whole nasty bunch and be done with it. What about His love and mercy? God must keep all of His character attributes in balance if He is to be righteous. Remember the hymn by Avis B. Christiansen? Love found a way, O praise His Holy name. With loving wisdom and power Elohim, brought forth the gospel which is the power of God to bring salvation to mankind. It was love that found a way. God retained His holiness, His mercy, justice and truth and His power gave it birth. The incarnate son of God was to be the way. In the form of Jesus, God could completely identify with man so He might bring redemption to a lost humanity. Psalm 85:11-10 describes the person of Christ. Love and faithfulness meet together; righteousness and peace kiss each other.11 Faithfulness springs forth from the earth, and righteousness looks down from heaven. Romans 3:19, 21 Now we know that whatever the law says, it says to those who are under the law, so that every mouth may be silenced and the whole world held accountable to God.But now apart from the law the righteousness of God has been made known, to which the Law and the Prophets testify.This righteousness is given through faith in Jesus Christ to all who believe. There is no difference between Jew and Gentile. This versetells us that the righteousness of God was manifested in the person of Jesus Christ, because Christ was God manifest (made known) in the flesh and the purpose of His coming was to atone for the sins of mankind. Romans 5:6-11 You see, at just the right time, when we were still powerless, Christ died for the ungodly. 7 Very rarely will anyone die for a righteous person, though for a good person someone might possibly dare to die. 8 But God demonstrates his own love for us in this: While we were still sinners, Christ died for us. He alone was suited for the task because He wrote the law which man had broken. He was without sin. He that was without sin became sin for us “that we might be made the righteousness of God in Him.” 2 Corinthians 5:21God made him who had no sin to be sin[a] for us, so that in him we might become the righteousness of God. Those who put their faith in Christ are declared righteous. Does God declare one righteous who is not? Not at all. The only true righteousness on this planet is imputed righteousness and imputed righteousness is the imputed Christ. I did not understand this for years and still discover layers of meaning as I study it today. When Adam sinned, his inner being was transformed. He developed an inclination to sin. Evidently it works like genetics. Our tendency to sin, the desires we have that are not a reflection of God’s thoughts, the condition of sin imbedded in us began with Adam and as his offspring, his sin is imputed or credited to us. We are born already morally impure and the original sin shows up throughout our lives in what we do, how we think, and how we make our choices. Adam not only passed on his humanity, and physical traits, and intelligence, He passed to his descendents his sinful nature. W are born sinners and that is why we sin. Lest anyone think this is unfair, how many people have been able to resist their legacy of sin? Just as the sin of our father, Adam, was credited to our account, another man without sin was needed to bring us back into right standing with ‘God. Jesus came as a man and lived a life completely pleasing to God. He was able to satisfy the demands of God’s law. He became the infinite lamb who bore the sins of infinite humanity. My sins were credited to him and He paid the penalty. Galatians 3:13 He became a curse for us. 2 Corinthians 5:21 God made Him who had no sin to be sin for us, so that in him we might become the righteousness of God. We become righteous through Christ. How does this come about? Create in me a pure heart, O God,and renew a steadfast spirit within me. Psalm 51:10 Only God can “create.” He alone can take that which in impure and ugly within us and fashion something entirely new. Our righteousness is in His hands. Our righteousness is in the LORD. The question is, Faith in what? The Word of God is clear. Mankind is guilty, unrighteous, filthy in the sight of God, incapable of doing good. We cannot attain, much less maintain, God’s standards of right and wrong; but God assures us that there is hope for sinful man. A careful examination of Romans 3-8 inspires an awesome reverence for God, who is the source of all righteousness. 13 Their throat is an open sepulchre; With their tongues they have used deceit: The poison of asps is under their lips: 4 Whose mouth is full of cursing and bitterness:15 Their feet are swift to shed blood;16 Destruction and misery are in their ways;17 And the way of peace have they not known: 18 There is no fear of God before their eyes. The fool hath said in his heart, There is no God. They are corrupt, they have done abominable works; There is none that doeth good. Paul is using this verse as the basis for his statement that no one is good, no one is righteous. There are no exceptions. No one is righteous. No one is deserving of God’s love. According to Romans 3:10, what are two other areas where man is lacking? Read Isaiah 53:6 Whose way are we following? All have turned away from God and His goodness. The throat is an open grave which spews the corruption of the heart. Filthy language permeates our society. We hear foul and filthy language on television and on the streets. This language comes from the corruption in the heart. Just as the stench of the corrupted body spews forth when the grave is opened, the rotten corruption in our hearts comes out when we open our mouth. 5. Read Psalm 5:9, Psalm 140:3, Psalm 10:7. a) Add to your list of “lip sins. 7. Read Proverbs 1:7, Job 28:28, Proverbs 9:10 What is the “fear of the Lord.” How should we act on receiving wisdom? The fear of the Lord is wisdom and knowledge of God is understanding that in order to be accepted by Him we must depart from evil. 8. Read Ecclesiastes 12:13 What is the duty of man? When we have the proper perspective of God, We hold him in awe as the mighty Creator of the Universe, as the source of all righteousness and wisdom. We will reverence Him by worship, trust, obedience and service. 9. Read Psalm 15:1-5 Who among us can claim to be perfect in our obedience to the list in these verses? We have learned that righteousness is being right with God; reverent and obedient. We also have learned that no one possesses righteousness nor can he be justified it by his own effort. 10. Read James 2:10. Can we keep the law? 11. Read Galatians 2:16.If a person could be perfectly obedient to the law, yet could not reach righteousness, how can it be achieved? 12. Read Hebrews 2:17-18 and II Corinthians 5:21 How does He make us righteous? Elohim, Father, Son, and Holy Spirit, possess the qualities of love, justice, holiness, truth, mercy, wisdom, and power in perfect balance. therefore, only God is righteous. (James E. Hanson, Reformed Presbyterian Church, Takoma, Washington) Because he alone is righteous, He alone can impute that righteousness to a sinful man who has repented and come to saving knowledge of Christ as his personal Savior. 13. Read John 1:12 Who has the right to become children of God? 14. Now reread the verse that uses the name Jehovah Tsidkenu for the first time in the Old Testament. Jeremiah 23:5-6, Revelation 5:5, 22:16 Who is the righteous branch? Who is Jehovah Tsidkenu, man’s only hope of attaining righteousness? 1. When you are right in your own eyes, you may not be able to see you own sins. 3. He made it clear that they could do nothing without him. B. (1.) The self-righteous want others to see their good deeds. ( 2.) The self righteous like to pray in public. ( 3. ) The self righteous want others to know when they re fasting. (4.) The self righteous are quick to judge others. 4. Our conscience fails to convict us. 5. We should show mercy to the one who has sinned. 7. God does not need me to accomplish His work, but because I love Him and wish to be obedient I try to live by His rules. 9. My punishment is more than I can bear. 10. (a) Job justified himself rather than God. (b) “Would you discredit my justice? Would you condemn me to justify yourself? (c) God knows your hearts. What people value highly is detestable in God’s sight. 11. We are stubborn-hearted. You are far from my righteousness. 13. Let me clothe you make you rich, heal you of your unrighteousness so we can see. 14. Their hearts were full of wickedness, but they presented themselves as the standard for righteousness by rigid obedience to the laws. They made sure others could see them pray and obey the letter of the law, but their hearts were evil. 15. lovers of themselves, lovers of money, boastful, proud, abusive, disobedient to their parents, ungrateful, unholy, without love, unforgiving, slanderous, without self-control, brutal, not lovers of the good, 4treacherous, rash, conceited, lovers of pleasure rather than lovers of God— having a form of godliness but denying its power. 16. Man has no righteousness of his own. All of us are unrighteous. 17. We get righteousness from God through faith. 3 If you think you are too important to help someone, you are only fooling yourself. You are not that important. (NIV) If anyone thinks they are something when they are not, they deceive themselves. Under the Law of Moses, man had no Savior. There was no atoning blood available to him. If he did right, he was righteous. Human effort produced the righteousness of man. When Christ came, the Jews could not rid themselves of the doctrine of justification through works. They could not accept the doctrine of righteousness by faith in Christ. In present times, many fail to take hold of righteousness that does not come from human effort. When we depend on our own efforts, we open ourselves to boast of our own self righteousness. Under the guise of man’s righteousness, atrocities have been committed that cause us to shudder in the face of such inhumane treatment of our fellow man. The Hitlers of history have believed they were operating under righteous fervor. A self righteous man will go to any length to force his ideas of right on others. Righteousness that is self imposed can have a result that denigrates mankind as a whole and destroys the capacity to see the benefits of the righteousness of God. Self righteousness blinds a man to their inability to be obedient wholeheartedly to the Law of Moses. The person who sees righteousness as coming solely from his own effort fails to see that the law is the righteousness of God defined in terms of human understanding. 1. What does Proverbs 30:12 say about those who are pure in their own eyes (self righteous)? So what is righteousness? Righteousness is the state of moral perfection required by God to enter heaven. That is a far cry from the definition of self righteousness. “Confident of one’s own righteousness, especially when smugly moralistic and intolerant of the opinions and behavior of others,” or as seen in the Bible, legalism…the idea that we can work a righteousness in our own effort that will be acceptable to God. 2. What does Romans 3:10 say about the righteousness of mankind? At one point in time or another, each of us think that we can be righteous in and of ourselves. Jesus spent a lot of time in his ministry teaching that righteousness in our own strength is worthless. We see it in Luke 18:9-14 in the parable of the Pharisee and the tax collector. The Pharisee came to the temple to pray, trusting that he had kept the law and by so doing was righteous thus anyone else was contemptible. The tax collector was humble and on his knees with grief because he knew there was nothing about him or his life that would cause God to look upon him in favor. Jesus spent considerable time teaching his disciples the dangers of self righteousness. 3. According to John 15:5 what did Jesus say about our efforts without him? How can we tell if we are afflicted with the spiritual disease of self righteousness? A. When we are adamantly sure that we are right, we have nothing else to learn. When we are sure that we have kept the law, we have no need for the righteousness of Christ. I am innocent of wrong doing. We see this is the story of the rich young ruler, and in Job. Job was convinced that he was righteous and became quite angry when it was suggested that he was not. Read Proverbs 12:1; Proverbs 19:20; Proverbs 18:2 (a) What does Proverbs teach about those who refuse to be corrected because they are sure that their own way is correct? (b) What is the end result of listening to advice and accepting instruction? (c) What does a fool delight in? From these Scriptures list five attitudes that are examples of being self-righteous. 4. Read Job 27:6 What happens to our conscience when we are convinced that we are right? When we are in that frame of mind, we become stubborn in our resistance to the word of God and our hearts become hard and impenetrable. We cannot see our own sin, yet the sin of others is quite apparent and it is our job to point out this lack to them. Therefore, another sign of self righteousness is seen when we look with contempt on others who are not as enlightened as we are. It may be that we are following the mandates set out by God in His holy word, but our self righteous attitude towards those who do not live up to our standards becomes evident when we correct others, when we judge them or complain about them to others. Any good we may have done is negated by our self-righteous attitude. Is the focus of our conversation, thought life,prayer life, and giving concentrated on the pronouns “I,” “me,” “mine,” and “my.” Are we like Job, who said in Job 29:14 14 I put on righteousness as my clothing; justice was my robe and my turban? He claims to have put on his own robe of righteousness. He is righteous in his own evaluation of self. We become complacent when we believe we are clothed in our own righteousness. We have no need to depend on God, to go to him for forgiveness because we are all ready righteous in our own sight. We are told to be aware of the needs of others and to take action. Because of our attitude however, we see no need to take action because we are already righteous and have no need to serve those less righteous that we are. When we do take action, our motives are not pure. Everything we do is colored by our need to be seen and praised by others. Are we truly grateful to be part of God’s plan of salvation for us? 7. Read Job 35:7 what would be your answer to the question Elihu posed for Job? Are we grateful to be part of His family and church? Do we truly understand that God does not need us to carry out His plan of redemption? Or do we think that God cannot survive without our help. Do we think that we are doing a service for God? Are we constantly thinking about what we have given up to be in God’s service? When we truly understand that God does not need us, but we need Him, we can give God the glory for everything in our lives. Do I feel compassion, empathy, for others? Do I feel their pain? When we have no compassion for another, we are quick to judge them, thinking that we would never act that way. I just don’t understand why they did that? We are sometimes so righteous in our own sight that we cannot understand the weakness of others. The key verse here is 5. 1-4 is God’s statement about the sins of the Judeans. Verse 5 exposes the holier than thou attitude they had toward others. 8. Write verse 5. I have often thought how grateful I am that my eternal existence is in the hands of a merciful, compassionate God and not in the hands of my fellow man. I cannot see into the heart of another. I cannot see a repentant heart. I know that I am not who I was yesterday. Only God knows and understands what goes on in the darkest parts of our soul. Only God understands the root of our problems and He is the only one who can lead me to repentance with love and mercy. How true is the adage, I cannot understand another unless I have walked in his moccasins. His path is different from mine and his heart is a mystery to me. I have no right to judge for I am in the same boat. 10. Do I accept the fact that I have sinned or do I try to justify what I have done? Do I have a basket of excuses from which to draw? When we are self righteous, it is difficult to admit there is sin in our life. Job searched his own heart but could find no sin that could have caused the trials he was going through. Read Job 32:1-2 (a) why didElihu become angry with Job? Since he could find no sin in his own heart, he blamed God. He even wanted to present his case to decide who was right, him or God. Job 23; Job 40:8 ; Luke 16:15 (b) What did God ask Job? (c) What does God say about those who justify themselves before men? 11. Read Isaiah 46:12; What does this verse say about those who are far from the righteousness of God? 12. Read Isaiah 64:6; What does this verse say about our purity and righteousness? 13, Revelation 3:17-18 What is the counsel of God? After reading the last group of Scriptures, answer the following question. Does a self righteous person see his sin for what it is? They cannot see the true character of their lives. Their motives in giving, praying, sacrificing, and good deeds are poisoned by their self-righteousness. Is self-righteousness sometimes seen as righteousness? Read II Samuel 15:1-6; Absalom went to a great deal of trouble to present himself to the people as one who cared about them and one who would rule over them with justice. David was far wiser and had more understanding of the problems the people endured than Absalom. David had lived the life of the commoner while Absalom had been raised as the privileged son of King David. Absalom was motivated not by the problems of the people but by his own ambitions. He stole the hearts of the people by appearing to be righteous. 14. Read Matthew 23:25-28 When Jesus called the Pharisees hypocrites, what did He mean? 15. Read II Timothy 3:1-5 List the characteristics of people during the last days. We can see this in our time. Many do seem to be Godly on the outside. They serve in the church, do good deeds, and they may even call themselves Christians, but in reality they do not give God the glory for anything. Their focus is on self. God warned the Israelites about self-righteousness in Deuteronomy 9:4. He warns them not to take credit for dispossessing the inhabitants of the Promised Land. It was not the righteousness of the Israelites that prompted God to act, but because of the wickedness of those who lived there. The Bible has many stories that exemplify the folly of self-righteousness. 16. After having gone through this study, what conclusions do you reach about the righteousness of man? However there is hope! 17. Read Philippians 3:7-10. Where can we get righteousness? Righteousness is available through faith in El Tsidkenu, the LORD our Righteousness, Jesus Christ. And that will be the subject of the next lesson. They did not recognize Him as God. They were not thankful. They began to worship idols. Men and women involved in perversion, Fornication, wickedness, covetousness, maliciousness; full of envy, murder, debate, deceit, malignity; whispers, backbiters haters of God, despiteful, proud boasters, inventors of evil things, disobedient to parents, without understanding, covenant-breakers, without natural affection, implacable, unmerciful. Those who commit these sins are worthy of death. When studying the declaration of Jeremiah that one was to be raised up who would reign as King, and bring justice and righteousness to the land, we need to understand the background. Just what was going on and what had brought Jeremiah to this point. Most of Jeremiah’s message was gloom and doom and hideous prophesies of exile and unrest. Then in the midst of all the tears and sadness is this gleam of hope, like a dim star in the Netherlands of the galaxy. biography, “he did evil in the sight of Jehovah.” In time the slide into depravity and evil in God’s sight brought Israel to a time when God’s judgment on them was imminent. Time after time He had come to their aid, and sent them prophets to warn them of the impending disaster that awaited them. Israel was in desperate need. They were spiritually bereft as their idol worship took them further from the blessings of the true God they had once worshipped. Morally, the people took up the religious barbarism of their neighbors and lived only for themselves, engaging in horrible religious practices that led many of them to engage in immoral acts around the heathen altars. Political intrigue and maneuvering for power fostered unrest among the people. Even the priest, were worshipping abominations adopted from their heathen neighbors. As God removed His hedge of protection, other nations encroached on their land and their liberty. The day of the Gentiles, the golden head of Babylon, stood ready in the future to begin the exile of the Israelites. son. He was present as a mourner when King Josiah was buried and the tears in his eyes were for more than the death of this good man. His tears would continue to fall as he witnessed Israel’s final fall into destruction. His heart would endure a lifetime of winter as he listened to God’s words, related them to the people, and harvested their bitter rebuke of unbelief. He knew he could not force their belief in his warnings. His harsh message broke his own heart. He was forced to watch as evil counselors resisted his words and precipitated the nation over the cliff. None of us can truly appreciate the righteousness of God, and until we understand just how far we are from the expectations of a Holy God, we cannot comprehend our need for His Gift. What provokes the wrath of God? of God is sin and provokes the wrath of God. Unrighteousness is the action of unrighteous men. Men deny the rule of God by their actions. They cheat, embezzle, steal, murder, beat their wives, and cheat on their mates…you name it. Unrighteousness, man’s inhumanity against man is prevalent in our society and provokes the wrath of God. 2. Does man have an excuse for his behavior? Creation itself is proof of a sovereign God to which we are accountable. 3. What was the response of man to the revelation of God in His creation? their own Gods from wood and metal using the creation itself as their inspiration. It was not lack of knowledge that led them here. It was not ignorance of God. It was willful rebellion against His eternal power and deity. And with this false worship came immorality and sinful practices which disgusted God and caused Him to give them up. In other words, He gave them over to judgment because they refused to see the light that was given. God does not forever strive with sinful man. There comes a time when He must judge and He will harden their hearts so they can no longer understand spiritual things. 4. List the unrighteousness which follows when man rebels against God. about what is right and wrong, yet we disregard and even flaunt our immoral choices and encourage, even insist that others commit the same sins.. We defy the consequences promised by God. We refuse to learn the lessons of nations who have received the judgment of God for their continued disregard of His sovereignty. 5. What does Paul say is the judgment of God for those who commit these sins? Read Romans 1:32 Can you relate news stories that point to groups trying to gain respectability for their sins by forcing the government to recognize them legally? Can you think of laws being passed that are in direct rebellion against the laws of God? How long will God put up with America? We have the truth. We condemn ourselves. ourselves in a personal way. First let me say that I believe prayers are answered in a mighty way, just not always the way we would wish at the time we pray. must be met for prayer to be answered? No, I do not. 5 And Jehovah descended in the cloud, and stood with him there, and proclaimed the name of Jehovah. righteousness is only a filthy rag in His sight. good or not so good. He makes no distinctions and His blessing flow to the righteous and the unrighteous. That being said, there are indications in Scripture that we can hinder our prayer efforts by certain behaviors. He was born of a virgin. “. . . ‘Do not be afraid, Mary, for you have found favor with God. And behold, you will conceive in your womb and bear a son, and you shall call his name Jesus. He will be great and will be called the Son of the Most High. . . . of his kingdom there will be no end.’ And Mary said to the angel, ‘How will this be, since I am a virgin?’ And the angel answered her, ” The Holy Spirit will come upon you, and the power of the Most High will overshadow you; therefore the child to be born will be called holy—the Son of God” Luke 1:30-35. Christ once for all” Hebrews 10:10. We must be convinced that Jesus lay in the embrace of death for three days in a dark borrowed tomb and that He routed death forever when He rose on the third day. from the dead, thou shalt be saved: Romans 10:9. No longer does man have to be separated from the gracious presence of God Scripture. We can face God dressed in the glorious robe of Christ, not because of anything we have done, but because of what Jesus did for us. Before you pray, Seek the Kingdom of God and His righteousness and all these things shall be added unto you. Since Jesus is the author of all things physically and Spiritually, I take Him at His word. How do I see His Kingdom? 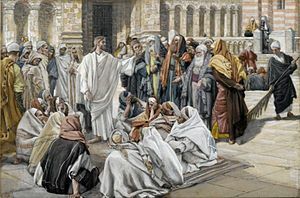 (Luke 17: 20-21) Jesus told the Pharisees the Kingdom of God was within them. A better translation might be “among you”. Jesus is a representative of the Kingdom of God. In Psalms 145:10-13 it says, “All thy works shall praise thee, O LORD; and thy saints shall bless thee, They shall speak of the glory of thy kingdom, and talk of thy power. To make known to the sons of men his mighty acts, and the glorious majesty of his kingdom. LORDS prayer says Thy Kingdom come, Thy will be done on earth as it is in heaven. Jesus is the Kingdom that is coming. We are praying for His return. We are to seek Him with reading and obedience to His teaching, prayer study, church attendance, giving, tithe, caring for others, and loving others. Before you petition God, sincerely, contritely, and fervently, ask for forgiveness of your sins. If we are forgiven when we become saved, why do we need to continue to ask for forgiveness. I found this quote from Pairtach. Puritanboard postgraduate, Puritan Board Forum that says it far better than I can. need to be nipped in the bud. (e.g. I Corinthians 5:6). purified further (e.g. Job 1:1; 40: 3-5; 42:5-6). Before you ask for God to prosper you, be sure you are observing and doing all of His commandments to the best of your ability. Deuteronomy 28:1-68 lists the many blessing available to those who observe and are obedient to His wishes. When you ask for God to guide and teach you, be sure you are open to God. When you ask Him to instruct you in His ways, ask in absolute awe and reverence, totally convinced that His laws are the only way to live. If you truly want God to plan your life and delight in your path, then follow the path He has planned for you. Study the Scripture to know what God’s word says about How to live and be convinced that His way is the only true way. study as you go about your daily life, as you pray. 18 And therefore will Jehovah wait, that he may be gracious unto you; and therefore will be be exalted, that he may have mercy upon you: for Jehovah is a God of justice; blessed are all they that wait for him. thee at the voice of thy cry; when he shall hear, he will answer thee. Me. John 15:4 Be connected! Remember what He has done for you when you pray. I wish I could tell you that if you will enlarge you ideas of what God can do, or that a prayer of confession and belief will prick God into acting on your behalf, providing you with health, happiness, and financial abundance. We know of too many people, who are good and faithful Christians, who suffer physically and emotionally. People who lose their jobs through no fault of their own; people who suffer tragedy and loss or who suffer with seemingly insurmountable health issues who do not see their situations get better. Bad things do happen to Christians. We have to begin with this fact. It is not about me! It is about God! It is not about you! It is about God. The Message says it this way. For everything, absolutely everything, above and below, visible and invisible,…everything got started in Him and finds its purpose in Him. It is God who directs your life. The life of every creature is in His power. “He’s got the whole world in his hands” is not just a Kumbayah song, but a great spiritual truth. You were made by God and for Him. Until you establish that fact in your mind, nothing makes any sense. Bertrand Russell was an atheist who said, “Unless you assume a God, the question of ife’s purpose is meaningless? He created you and life is about whether you are going to let God use you for His purposes or not. His purpose for you was declared before your creation and you had “0” input, but what you do about your purpose is your decision. There is a much larger purpose that is part of an eternal plan designed by God. That ought to make us feel great. It is more than getting up in the morning, brushing our teeth, eating breakfast, going to work, eating lunch, going home, eating supper, washing out our socks, brushing our teeth and going to bed. God’s will is always for the good of the Saints. When we pray, we do not know the whole picture. What we ask for may not be for the good of the Saints. We have to be sure we understand what God wants or at least accept His unknown purpose in the matter is preparing you for eternity. Remember, God says yes to prayers. He also says no, and He sometimes says not yet because He needs time to refine you and your prayer to conform to His will. I want to end with these two verses of great comfort regarding prayer and God’s promises. God does not love you because you are good, but because He is good. it is what He has purposed Himself to do…because He first loved us! How does God want us to petition for our desires and needs in prayer? As we study God’s word, we see how He has provided in a myriad of circumstances, sometimes with miracles as with Elisha and the widow, sometimes with circumstances as with Esther, and yet the answers to our problems seem distant and farfetched. We wonder how we can access His provision for ourselves in a personal way. We can see that God makes provision for us in mighty and small ways. Does He make the provision and then walk off to enjoy the heavenliest without further thought of us? Does He want us to pray? Here are some passages of Scripture where we should be able to see that God wants us to pray and He wants to answer those prayers. I know this is a lot of Scripture to look at and explore, but this study is not meant to be a shallow reading of the word. We are seeking answers to our problems. We are trying to fill the emptiness in our hearts that only the understanding of the word of God will fill. So just take it as you have time and don’t worry about finishing every question at one sitting. needs for living the kind of life required of him comes only when we have sought for it, and persistently and fervently prayed for it. Think about how you have previously interpreted this verse. Do you have a different perspective? From these verses, what should we be praying for? Read Matthew 18:19, This verse is talking about church matters the pattern for conduct in the church. 2. What are the conditions found regarding this verse? This means He will hear and answer any request that Christ Himself would make. In His name means asking for something that is within His will. Bible. There is a condition listed in this verse. read the verse above, Matthew 21:21. You must believe that God can and will move in a miraculous way. Read Mark 11:24 Can we really move mountains? We can, but why would you want to. They are beautiful where they are. We need to pray for power to move the daily mountains of worry, problems, and weakness of Spirit. We need to pray to be strengthened in our Spirit that we might have the power to pray in ways that will change the world, not that our own selfish desires might be met, but praying that we might have the faith that will allow God to do His will in our lives. 4. Do you really pray for God’s will in your life, or do you pray for specific desires to be met? When you ask for God to give you something, regardless of what it is or its importance to you at the time, are you really willing to ask for God’s will to be done? Write the line in the LORD’s prayer regarding God’s will. Read Luke 11:13 Again, we do not always see what this verse is really saying. 5. What does this verse say that God wants to give us? At this time, the Disciples were beginning to understand how difficult it was going to be to be a true disciple of Christ. They did not have the Holy Spirit. We receive the Holy Spirit when we are converted. We need to pray that the gifts of the Holy Spirit be manifested in us; that we might have the power of His ministrations in our lives. Read John 14:13-14 We read this verse with great enthusiasm. All I need to do is ask for something in Jesus name and I will get it. We need to read further. John 14:15 tells us the requirement of the above verse. be truly for His glory that we pray. The promise that the prayer will be aswered is only to those who love HIm and who obey Him. The evidence of our love for Him is our keeping the commandments. His name we are to be praying as He would pray. Because we are to become like Him our prayers will become less selfish, less worldly, less self consuming. He is at the right hand of the father as ourintercessor; answering every prayer that was asked in His name, praying as He would pray. The prayers will be answered because Jesus is worthy and we are not. That is why it must be asked in His name. Read Romans 10:12,13 God is rich to all who call upon Him. Is He talking about riches of the world? 7. What gift is Paul talking about in these verses? It is available to all who call upon Jesus. 8 . Read 1 John 5:13 to see why we can come before God with boldness in our prayer petitions? Write it here. unselfish, and in accordance with God’s will. We have seen some of the instructions God has given us to insure that our prayers are answered. Let’s explore them further. We are not promised that every prayer will be answered. All of our whims, wants and desires are not going to be answered. obvious prohibition is that God hears only one prayer from a lost man. He must first recognize he is a sinner and ask for forgiveness. He must receive Christ as His Savior. Those who reject God do not have the ear of God. We must have faith or belief in God, unwavering faith that He can, that He wants to, that He will care for you. 11. What makes it impossible to please God? What must we have when we come to God?